Looking to trade my 2000 Civic hatchback for a 85-87 corolla GTS or SR5 converted. Willing to add cash on top for the right one or you can add cash if needed. PRICE IS FIRM AT $8000 or I'd keep it. Its a 2000 civic dx. Clean title with working ac and looped PS. Just had the ac serviced with a hose replaced and recharged it's ice cold. Car runs perfect and gets 35mpg. Car has a high compression b20 swap with a LS transmission. Resurfaced the flywheel and a new Exedy OEM replacement clutch when it went in. The motor has a skunk2 intake manifold and ITR throttle body to replace the tall OEM one. It also has a Toda replica header and Apexi WS2 exhaust so it's very quiet and zero drone. When I did this swap I used the OEM d16y7 harness and adapted the sensors I could, however I am not happy with this since the d16y7 manifold is odd so I bought an OEM uncut 99-00 Civic SI harness meant for a B series motor I just haven't installed it yet because it's cold and the car has been forgotten since I got the new 2017 Civic Type-R. Check engine lights (CEL) are on for knock sensor as it cannot reach with y7 harness but with 99-00 civic SI harness it will. Also has a CEL for the IACV I converted the 3 wire plug to a 2 wire plug as per a write up on Honda-Tech but it still stays on the new harness will fix this as well. Currently idles perfect at 1300-400 while cold and 900-1000 when warmed up. I replaced just about every gasket and item like the thermostat possible before I installed the motor. have the Integra rear disc brake conversion waiting to be installed. Brand new Hard Race rear trailing arm bushings (RTA bushings) and new pads/ rotors so everything will be new back there. I am probably forgetting something but all windows were removed for a complete color change. Full paint job not including the labor of disassemble and reassemble was $3800 - have receipt as well. has a nice alarm as well that completely kills the power so it's not getting stolen unless they tow it. I was trying to keep track of prices but stopped as it got too sad how much I spent on this thing. Probably forgetting more but asking $9,000. I know that seems like a lot but on just the clean title car alone and paint (with me doing all the prep work myself) I spent $6,500. Then add in like $2500 in OEM CTR exterior parts and another 4,500-5,500 is misc parts I am about $13,500-14,500 into this car not including me doing most of the labor. It wasn't meant to be resold but I got the chance to buy the 2017 CTR and did so now it's un needed to have two FWD hatchbacks in my mind. Please don't tell me how your cousins friend has one that's the same for half price because he doesn't. 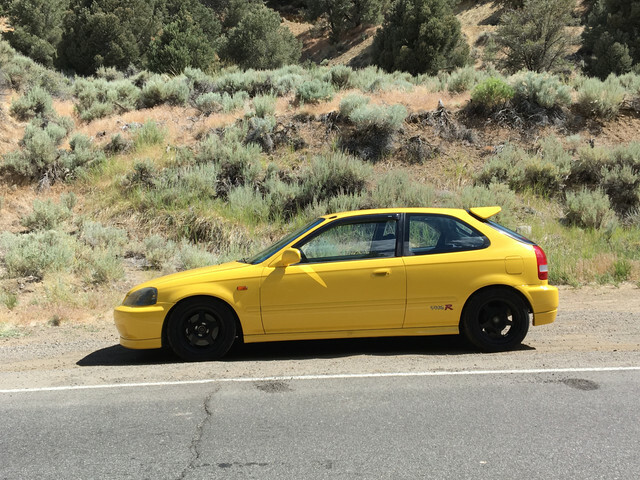 I am in my thirties and have been into Hondas since I was 16 I planned all the parts on this car to make a very fun street car that can handle much more expensive cars on the track all while staying comfortable. I am not in a rush to sell this just know it's not getting the love it deserves. can see most of the build here. Thank you I'd like to think it is with all the time and money spent. Not in a rush to get rid of it that's for sure. FYI, there are 2 GTSs for sale in the bay area. one HB and one coupe.